Oh those do look like sequin pants in many of these photos! What a great printed detail, perfectly festive! :) I wish we had stich fix or something similar here in Australia. You look great Rachael! I am glad you kept the sweater. The color, fit, everything looks great on you. I have heard of Stitch Fix but haven't really tried. I shall go and check it out. Happy Friday! Love the glam in this outfit, so pretty! That sweater is great! Love the color! Have a great weekend dear. I totally thought they were sequence pants until I saw the splatter later on. They are fantastic, I've never seen anything like this before. I love all the pieces, it would be hard to just pick one or two items. Enjoy your weekend and thanks for hosting the link-up. Those pants are fabulous! Perfect for the holidays! 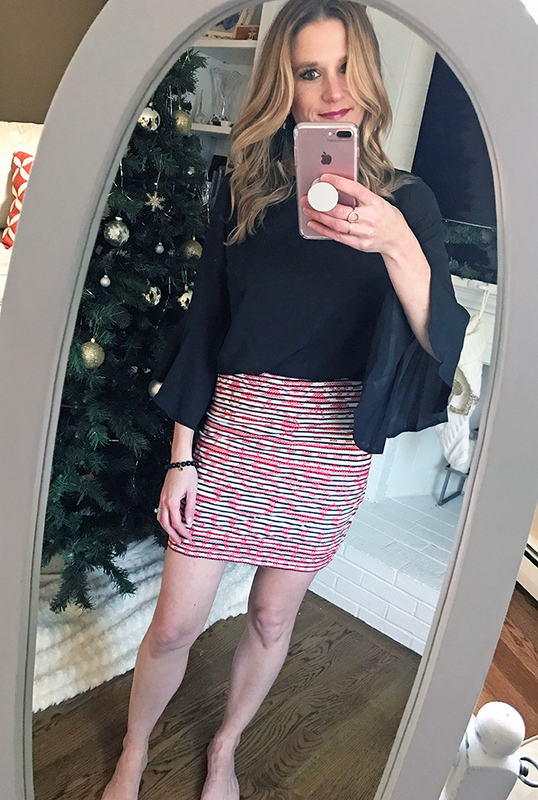 I really love Stitch Fix, too! I have never been disappointed in a box. I haven't ordered from them in awhile and hope to once things slow down a bit here! Lol! I LOVE those pants, I really thought they were sequin at first!! 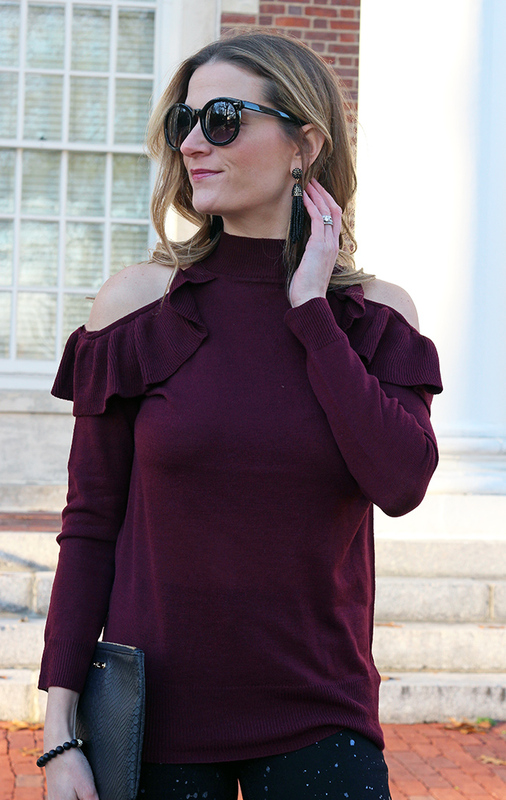 I also love the burgundy cold shouldered top, it def. works for the holidays! omgosh these leggings are amazing!! I just ordered a Stitch Fix Men for my BF for the holidays! I just LOVE those sequin pants girl!! Such a fun holiday piece. I wish we had StitchFix in Canada!! These jeans are so fun and perfect for the holidays! These pants are amazing! Love how you styled them, perfect holiday look! Oh Rachael, those jeans! How fun! They are so shimmery and shiny. I adore them! Perfect pairing with the burgundy sweater! I love that sweater! It's so pretty and the ruffles add such a cute detail to it! I also just LOVE those jeans! They are really fun and would add some shimmer to any look you style! Love the whole outfit! Gorgeous outfit for holidays! 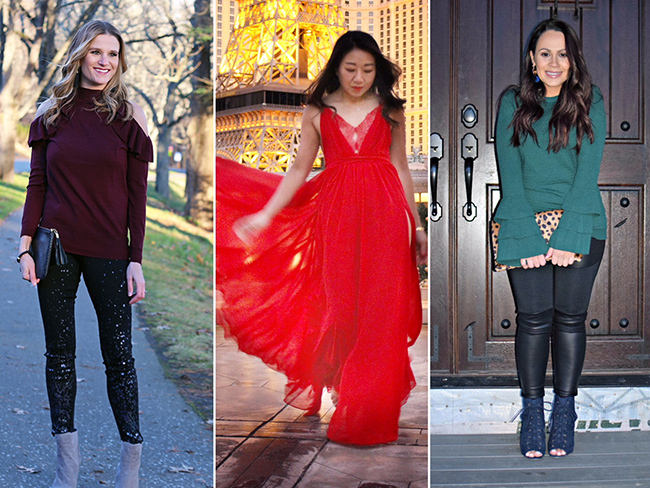 These pants are perfect for the holidays! I love how you wore the top and boots with it. I love those jeans! I thought they were sequinned at first. Those pants are so festive! Such a fun print! Love! Loving your leggings dear, really fab pick! You always have such fun things from them! I love those leggings. I love this stitch fix! Those pants omg are so great for the holidays! I thought those pants were sequined when I first looked at them until I read they were paint splatters! They are so cute! And I love your sweater! The pants do look like sequins in the photos, I had to look really closely! They're so cute! I haven't tried stitchfix, but it would be fun to have someone else's eye and to try new things! I love your sparkly pants and the shoes are amazing!